Last update for DF v34.11. Requests for small island embarks come up fairly often. In one of those topics someone posted a method for reliably generating them. Rather than having it outdated and buried I decided to tweak, update, and give it it's own thread. Credit goes to Grax for the original world generation parameters. Modified raws and new DF versions cause old parameters to generate different islands so you'll have to find your own islands as described bellow. Paste these world generation parameters into the end of your data/init/world_gen.txt file. Run DF and select "Design New World with Advanced Parameters". Select "ISOLATED ISLANDS" from the bottom of the list. Modify embark points, cavern openness, and similar to taste. Start playing > Legends Mode > export detailed map (whichever one you find easiest). Open the exported image file and search for small islands marking their location. Start playing > Dwarf Mode > check out the islands you've found. Repeat until you find what you're looking for. Depending on how small you want your island you may have to generate many, many worlds. Keep in mind that the map only gives a rough idea of the island's shape and size. It's best practice to embark a couple of times to make sure you've got the whole island in the smallest embark possible. To save time make a backup of the world before embarking. As a rule of thumb assume the island is a tile larger on all edges save those edges bordered by only beaches. 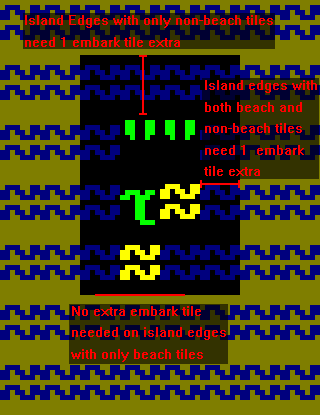 The land on non-beach tiles on the local embark screen tend to overlap into neighbouring tiles while beach tiles rarely do. This means they are bigger than they appear. example embark 1, example embark 2. Add these before you go looking for an island. If you add these later identical seeds will give you different worlds. Swamp, Marsh, Forest, Grassland, Savannah, Shrubland, Desert, Badlands, Wasteland, Hills. Temperature determines some biome characteristics but unfortunately we have little control over this. If you want a world without glaciers then you can paste this into your world_gen.txt after the already pasted world generation parameters. All islands will be warm / temperate. Alternatively you can tweak the Minimum / Maximum Temperature settings in Advanced Parameters how you like. If you find the perfect island but it has the wrong minerals then regenerate the world with all the same seeds but a new history seed. This will give you a new mineral layout without changing anything else of importance. If you decided to generate a world with glaciers only to find they are covering the perfect island then don't fret. You can push them back somewhat by regenerating with the Minimum Temperature set to 75 in Advanced Parameters. If you've found the perfect island and want it good/evil aligned then increase the "Desired Good/Evil Square Count in Small Subregions" in Advanced Parameters then regenerate using the same seed. Expect more map rejections and even completely failed maps if set too high. You'll have to regenerate a lot before it randomly picks the island you want to be good/evil. Hunting for small islands with volcanoes is a lengthy process. To increase your odds paste this into your world_gen.txt after the already pasted world generation parameters. Then set Minimum Volcano Number to 200 in Advanced Parameters. Keep generating new worlds with new seeds checking each volcano on the map until you find one on a small enough island. Volcano location is tied to the world seed so the same seed will always have volcanoes in the same places. Hopefully I've not missed anything and that you find plenty of decent little islands. You are a god among dwarves. Oh yeah: Nazis. Now I lost the argument. So you can't argue with me anymore. Nyah. I'm glad you guys like this. Wow. That's actually pretty damn impressive. Is there any way to have some minor land connections though, so you could both have an island embark that covers an ENTIRE island and allows some wildlife to come through, along traders? Or should I just mod every race the venture forth from the caverns? Unfortunately you will never see traders, migrants, or sieges but this is desirable for hermit challenges and similar. One thing I tried that failed was to make a row of 16x2 embarks from the nearest civ to the boarder of the region the island is in. 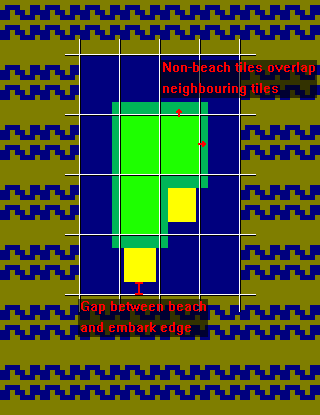 The problem here is the 16x16 landless ocean gap around the small islands and between some of the larger ones; Even when using Just Embark the game hangs because it can't place the caravan. I remember seeing small islands just of the coast before in normal world gen. Islands which could be connected to the mainland more easily. I'm not sure how these form but it might be possible to make them more likely to appear. If I could see a hand full and the params that caused them I might be able to do something. I didn't know you could get trade through the caverns. Is this confirmed? "The only thing you will need is patients." Most excellent, thank you very much for sharing this and putting up some example images. I love embarking with ample water (oceans, lakes, etc.) on a regular basis. Most of my own efforts have revolved around creating more freshwater embark sources by generating larger lakes & rivers. Very cool to see something like this is possible for saltwater site generation. Does adding additional metals change it, or only stuff you dig up? I copied the iron entry and pasted it at the bottom of inorganic_metal.txt before renaming it IRON2. I genned two words with the same seed one with the new metal one without. They both are identical. I hope this is what you meant by adding a new metal. Ala Kotraldermechebi, Hoardcounter has given birth to octuplets. You are likely doing nothing wrong. Most of the islands will be too large but on each map you will almost always have one that's small like the ones in the OP. You'll notice the most I found on one map was two. This is why patients is so important.